This fall a few colleagues and I presented at the Virginia Library Association’s Conference on building technology into library services for youth. We wanted to feature some of the ways public libraries have found methods of incorporating technology into their repertoire. As the new year kicks off in a week, many librarians will be making goals for the new year and plans for the summer months and Summer Reading/Learning. In 2015, Mary Ellen Icaza of Montgomery County Public Libraries, helped launch a new Summer Reading tool after she and her staff dreamed of the ideal online summer reading program that had well-designed user experience features, an app or responsive design to use on smart devices, digital badges, and also the ability to manage statistics and run reports effectively. 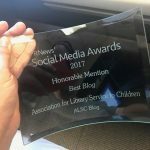 Everyone can agree, that all the tech bells and whistles are awesome, but most of all, as children’s librarians we want any online experience to be interactive and FUN. This summer, the library system was able to become a beta site for a new summer reading platform that featured online registration, book tracking, badges, weekly email reminders to pick up prizes, book recommendations, event suggestions, as well as browseable book and app recommendations by librarians. They also chose the physical option of print badge books with stickers. Kids still love print materials. Just because you’ve done something one way does not always mean it makes sense. You can never plan too early. Changing tech is hard on staff and customers. Good design does equal increased participation and possibilities. Parents wanted to do Summer Reading too! Weekly reminders keep engagement going and brings families into the branches. At Frederick County Public Libraries (FCPL), the “Traveling STEM Lab” concept was born out of a need to offer more STEM programming in the system’s smallest libraries. The community’s branches range in size from a one-room library to a 5,000 square foot library and lack storage space to keep comprehensive STEM programming materials. Janet Vogel helped develop a 4-suitcase system (one for each letter in STEM) so a new “STEM Lab” could be couriered to the branches each week. Because of the ease of transport and reusable components, the kits can be used in the community as well. The suitcases fit easily in a car and can be pulled out for everything from STEM night at local schools to a table at a community festival. During outreach, having an activity to keep kids busy allows librarians to chat with parents about library services. The outreach tables include an iPad for demonstrating eResources, creating library cards, and talking about ways to use technology with kids. In addition to the suitcases, librarians used grant funding to purchase laptops and iPads that rotate via the courier to all of the local branches. Staff can request them for storytimes, coding clubs, and special programs. By rotating materials, the library ensures that staff have access to equipment to assist in developing high-quality programs at a fraction of the cost of outfitting each of the branches. This broadens reach in the community and ensures that the librarians have materials that enable them to model media mentorship regardless of location. Lastly, my library’s T|E|A Room initially started as a makerspace which was resurrected out of our children’s computer lab. The Children’s Library had offered technology programming for pre-schoolers to parents, but made it a point to move from special tech programs to making it a part of the regular programming the library offers to our community. 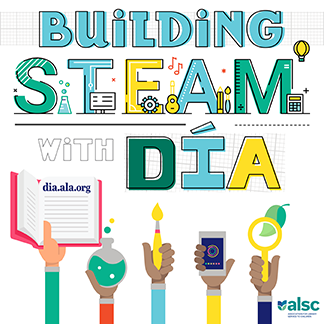 Focusing on STEAM disciplines, T|E|A stands for technology, engineering, and the arts, the space has prompted monthly coding classes (some taught by teens in the community), messy art for preschoolers, and regular soldering sessions for families. The main draw for the room technology-wise is definitely the 3D printer. Kids are still fascinated with 3D technology and the library is the one place locally that they can access such tech. This prompted monthly Intro to 3D Printing classes in our Tech Lab, which is a session of mostly discussion and learning vocabulary for the printers. The month of December has always been an opportunity to encourage kids to make their own gifts in the T|E|A Room, with both a mix of low and high tech. This season the showcase included mini-knitted caps, LED greeting cards, and assorted Pokemon 3D objects. This is just a small taste of the ways technology has impacted libraries and become such a huge part of library services to children. We hope this plants some seeds for the next few months as we continue to think about our roles as media mentors in the lives of children. Claire Moore is currently the Head of Children and Teen Services at the Darien Library in Darien, Connecticut. At the end of December, she will be moving out West and will work at the Manhattan Beach Library. She can be reached at clairemoore@mac.com. Mary Ellen Icaza is the Public Services Administrator, Community Engagement, Programming and Learning for Montgomery County Public Libraries. Janet Vogel is the Youth Services Manager for Frederick County Public Libraries.